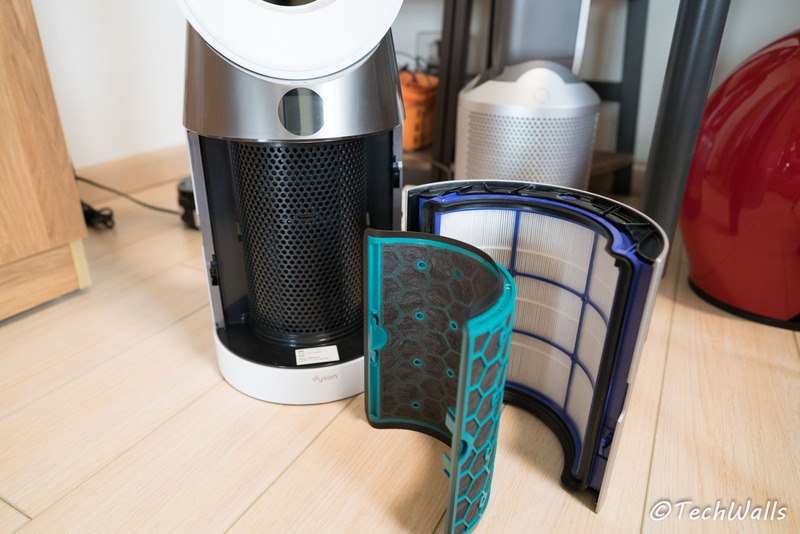 I’ve used a ton of air purifiers from different brands like Dyson, Xiaomi, or Levoit but I haven’t been satisfied with any of them. They might have a good performance but they fail to give me a clear picture of how the air quality is improved. I was so excited when trying the new Dyson Pure Cool TP04 purifying tower fan because it has all the advanced features that I’ve waited for years. 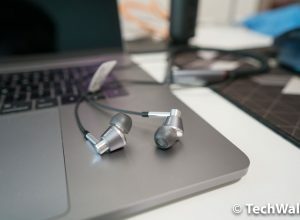 The Dyson TP04 is the upgrade from the Dyson TP02 and AM11 that were released 2 years ago. It might have a similar design as its predecessors, however, there are actually many changes from the inside out. Dyson cares into details as you use the product during winter days. When you enable the backward airflow feature on the remote, the TP04 will reverse the airflow and blow the air through a slit in the middle of the Air Multiplier loop. 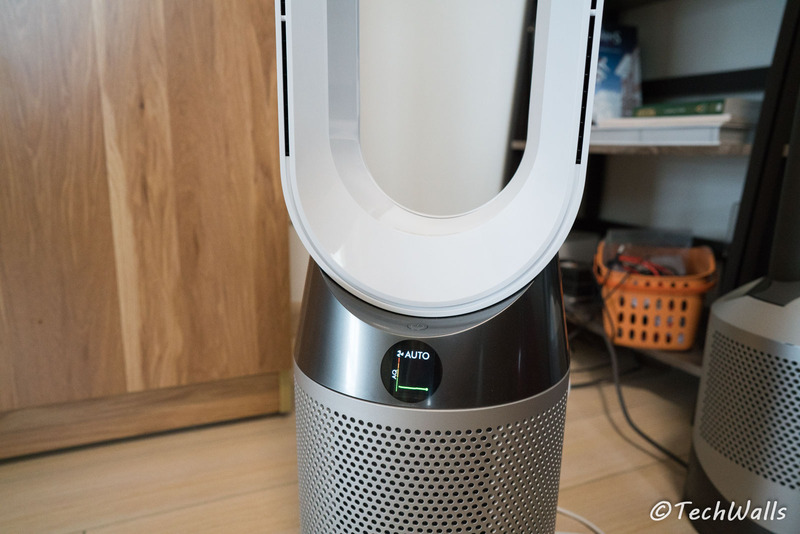 Therefore, it won’t have the cooling effect on cold days, the purifying function is still working like normal and it works like an air circulator as well. Another nice feature is the 350-degree oscillation. 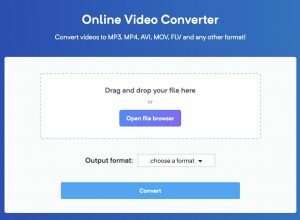 You can switch between some preset angles like 45, 90, 180, and 350 degrees. That means you can spread clean air across your room and don’t have to focus only on a specific area. If the new Dyson air purifier stopped there, that would be a huge disappointment. And fortunately, the UK manufacturer stepped it up by introducing the new circular LCD display on the front. Moreover, there are a bunch of data to consume with it. 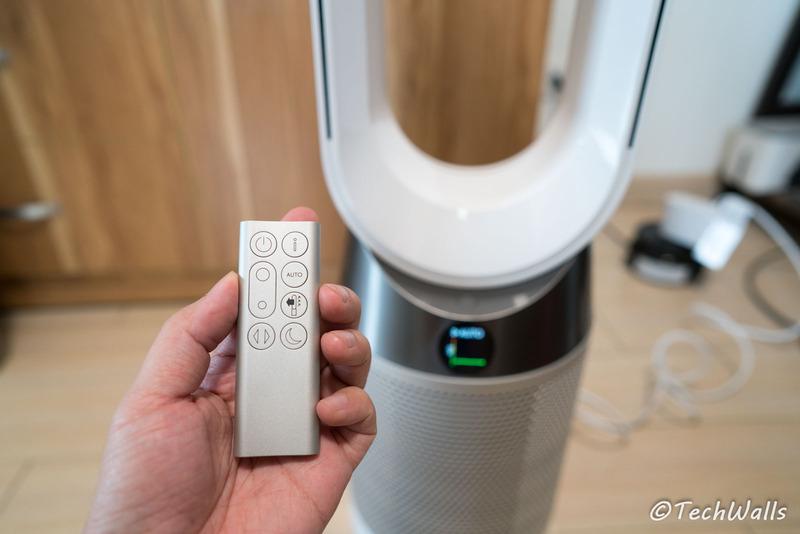 Equipped with upgraded sensors, the Dyson offers a real-time and 24-hour chart of air quality, along with some other important readouts like PM2.5, PM10, VOC (Volatile Organic Chemicals), NO2 (nitrogen dioxide), room temperature, humidity, and filter life. I’m so glad that now I can see everything on the LCD display and control the fan with the remote control. In case you want to see everything clearer, you can open up the Dyson Link app. The app displays the same information as seen on the display, besides, you will be able to schedule the fan or control it when you lose the remote control. It is also a great device for your smart home as it is compatible with Amazon Echo. Basically, you can use your voice to turn it on/off, adjust the fan speed, activate the night-time mode, enable/disable oscillation, ask for the current air quality, etc. Google Assistant and Apple HomeKit are not supported at the moment. 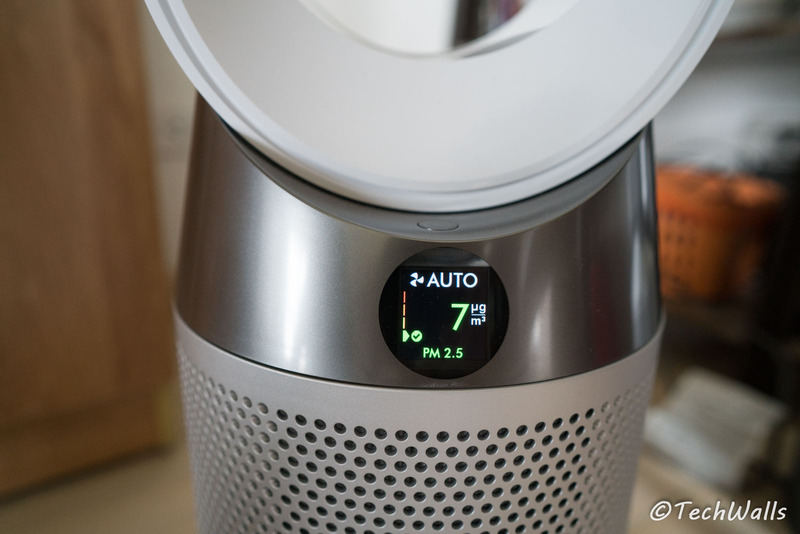 The Dyson can sense pollution events automatically and capture fine dust. If you have a dog or a cat in your house, even when you don’t see the pet dander, it is actually flying in the air. The Dyson TP04 features 60% more HEPA, 3 times more carbon, and a faster clean air delivery rate system. You can see that the filters are taller and thicker now. They include a pair of a HEPA filter and an activated carbon filter. The filters are separated and you can replace them with ease. You might see different filter life for the front and rear filters. According to the manufacturer, you will just need to replace filters once a year if you run the air purifier for 12 hours a day. The HEPA filters can trap airborne particles as small as 0.3 microns (ultrafine particles and viruses) with the capture rate of 99.95% while the activated Carbon filters will capture odors, smoke, VOCs, and other harmful gases. The difference in air quality is pretty clear, especially when I tested it in an air-conditioned room. This is truly a must-have appliance if you have allergies to pets, pollen, or dust. It can capture almost all pollutants that are circulating in my room. I use the Dyson as a tower fan as well and I feel really great when it blows clean air to my body. The previous Dyson purifier I used was the Dyson HP02 but it doesn’t have the same performance as this one. 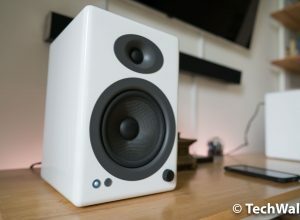 It was tested to have a great performance in a 290-sq-ft room or smaller. According to the manufacturer, the maximum coverage area is 400 sq ft. 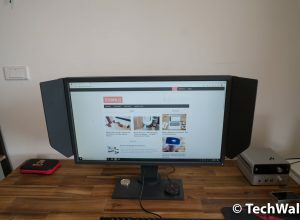 However, the only problem is that the airflow is still not as strong and wide as traditional bladed fans, therefore, it might be not good enough to cool you down during hot summer days. I leave the purifier in auto mode most of the time as it will adjust the fan speed automatically depending on the current air condition. 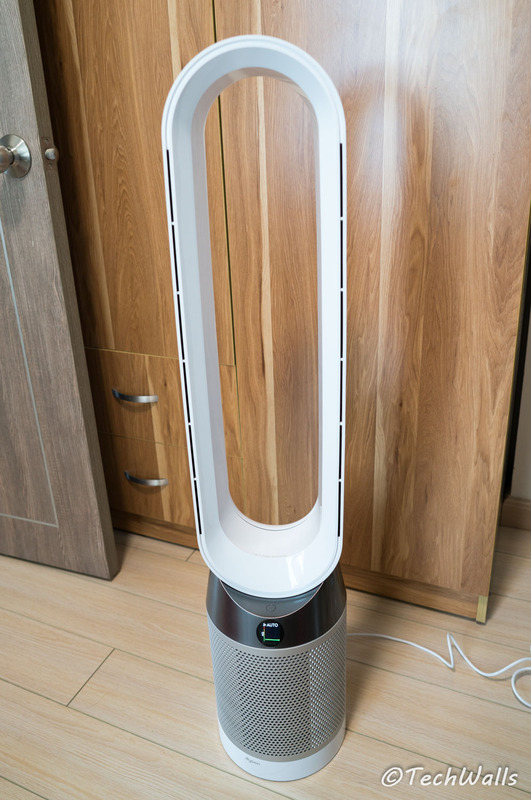 If you live in a polluted area, the fan might be a little noisy since it has to work at its maximum power. It would take hours to see the air quality improves and the fan runs slower, so you might need to adjust the fan manually in this case. Notably, the purifier will also dim the LCD display and turn on the night mode to reduce the noise level at night. When the fan runs at the highest speed, the noise level in my room is measured at around 57dB. The Dyson Pure Cool is not only well-designed, but it is also packed with a lot of new features and all of them perform really well. We at TechWalls highly recommend the product if you want to improve air quality in your home or office environments. The only air purifier that I would buy. It has all advanced features to keep track of the air quality. I just got this fan and find this review to be very accurate. Even though it’s the winter so I haven’t wanted to test it’s airflow, I can definitely tell it’s not as powerful as my AM07 non air purifying tower fan. With that being said it seems to be an excellent air purifier and the design is the best bar none. A little expensive but I think of it as art in your home. Set it to 350 degree circulation and watch your friends gawk.